Anat Belasen is a PhD candidate at the University of Michigan, originally from upstate New York. She is currently in Tim James’ lab, where she is researching the effects of forest fragmentation on frog health. Specifically, Anat is examining how frog host genetics change with fragmentation, and whether these genetic changes affect susceptibility to fungal pathogens and/or diversity of fungi and other microbes in the frog skin microbiome. When she finishes her PhD, Anat is looking for a post-doc where she can delve deeper into the mechanisms that lead to differences in infection susceptibility. She is thinking about using experimental approaches to examine coevolution between pathogenic fungi and their hosts. Anat was recently awarded a Predoctoral Fellowship from the graduate school at U of M, which she’s pretty excited about! She also thinks it’s pretty cool that she took home an oral presentation award from the Association of Tropical Biology and Conservation a couple of years ago. What’s your favorite fungus and why? I love finding Cerioporus squamosus (the scaly polypore) in the park near my house in Ann Arbor. Can’t get enough of that watermelon rind smell! What is your favorite thing about fungi? 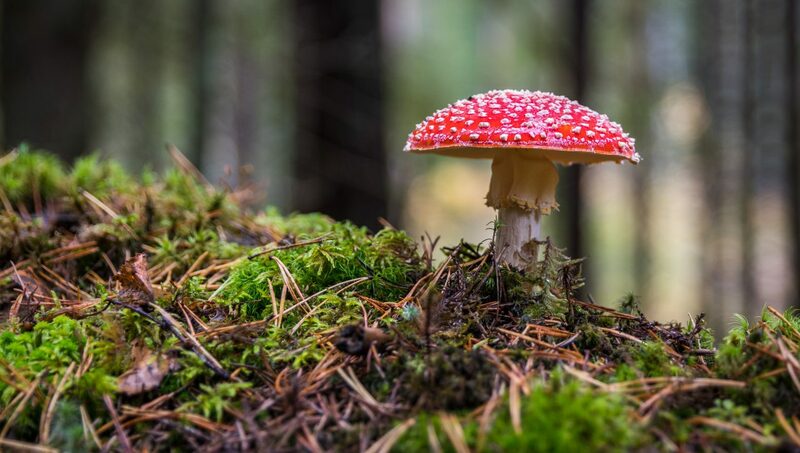 We as humans have so many relationships with fungi – they attack us, they help us, we eat them, we domesticate them, some fear them, many love them. Once I was out in the field at night in the Atlantic Forest of Brazil with another American student and a couple of Brazilian helpers. We saw what we thought was an extremely rare sighting: a blue Morpho butterfly that was out at night! We oohed and ahhed as it floated toward us… But as it approached, something very strange happened. While Morphos are known to be shy, when this guy got close to us it flew right into our faces (because it was attracted to our headlamps) and kept slapping us with its giant blue wings. It seemed to follow us for nearly half an hour, going from person to person and basically beating us up. A beautiful, serene moment had quickly turned to us being terrorized by this thing! Finally, one of the Brazilians who was out with us told us to turn off our headlamps and walk in darkness for a bit, which worked like a charm – the butterfly finally flew off. Later I talked with an entomologist who told me it actually must have been a Caligo moth, which look a lot like Morphos but are a lot more aggressive, and are notorious for laying the smacks on field biologists who are out at night with headlamps. I love to garden. Nothing is as cool to me as growing my own food from a tiny seed. This year I’m trying out straw bale gardening – it’s basically a cheap and lazy way to make raised beds in any sunny spot in your yard or around your house.